Cluster flies are a little bit larger than the regular house fly. Live or "fresh" cluster flies have fine gold colored hairs on the sides of their thorax. They are called cluster flies because they overwinter in large clusters inside wall voids and attics. They enter your building in the fall and overwinter there. These are the sluggish flies that you may see on a sunny winter day congregating by a window where there is warmth. They are not found during the summer as they exist outside only as larvae underground. The cluster flies lay their eggs in the soil in the spring. The larvae, or maggots, live all summer as parasites in the digestive tracts of earthworms. They do not breed inside buildings, but they spend their winters there "hibernating". 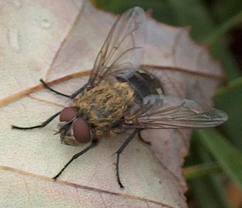 In early fall (late August to early September), the adult flies will move in large numbers to a wide variety of buildings, i.e. homes, apartments, offices, schools, etc. They gain access through whatever cracks and crevices they can find which doesn't take much. They crawl under siding, attic vents, cracks around windows, etc. Once they are in, they will settle in wall voids, attics, and other undisturbed parts of the house. Cluster flies are not like other flies that breed and/or eat filth. It is impossible to clean them away or use a bait to remove them. The only reason they come in is for shelter. Ideally, they should be prevented from entering in buildings that don't have any gaps or cracks for them to enter. This is generally not possible, as even a brand new building or house could still have an issue with cluster flies. The most effective control is treating the exterior of the building with an insecticide to prevent them from entering. To do this, we come out with a power sprayer and treat the entire exterior of your building. There is generally a short window to do these treatments (late August to early September) and another treatment (late September to early October) so that the insecticide is in effect before they start congregating and allows it enough residual to stay in effect during their period of entering buildings. If you have gotten cluster flies in the past, you will probably get them the following year. To ensure you get your treatment done, it is very important to schedule an appointment with us before they start coming in.